Border Patrol agents on May 18 arrested seven foreign nationals in Los Angeles, including a 22-year-old “immigration activist,” as part of an investigation into a “cross-border narcotics smuggling operation.” All the immigrants including the woman activist called Claudia Rueda-Vidal of Mexico were arrested on charges of visa terms violation and not drug offenses, Border Patrol officials said in a statement. However, in April 2017, Claudia’s parents Teresa Vidal-Jaime and Hugo Rueda were arrested during a raid, which led to the discovery of huge quantities of drugs and cash. The investigators seized more than 30 pounds of cocaine, $600,000 in cash and an ounce of crystal meth. Claudia came in the limelight when the Los Angeles Times reported her joining a protest against her mother’s detention and deportation proceedings. According to media reports, Vidal-Jaime and her daughter Claudia, who is attending classes in Los Angeles, illegally entered the United States in 2001. 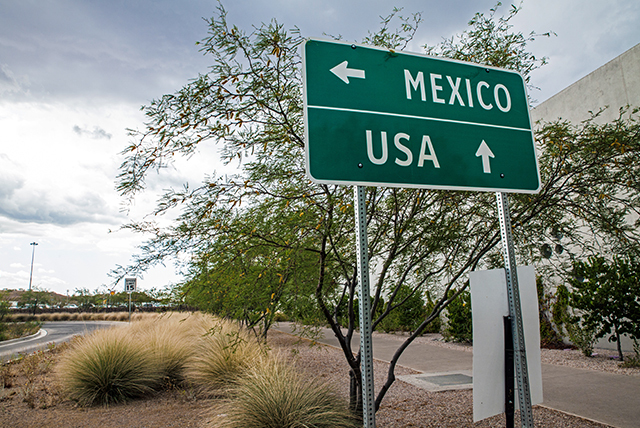 Owing to its proximity to the Mexican borders in the Southwest, large immigrant population and extensive network of interstate highways connecting different parts of the U.S., California is a major gateway through which drugs flow to other parts of the country. The ever-growing volume of traffic at the border makes the ports of entry (POEs) highly prone to drug trafficking and money laundering activities carried out by drug cartels. The 2,000 miles of Southwest Border (SWB) stretching from San Diego in California to Brownsville in Texas comprises multiple entry points for cocaine, heroin, marijuana, methamphetamine and other dangerous drugs and precursor chemicals produced in Mexico and other South American countries. This region is covered by the Southwest Border HIDTA (High-Intensity Drug Trafficking Area), which aims to curb narcotic trafficking activities along the border. The U.S. Drug Enforcement Administration (DEA) says that Mexican drug cartels control the entire illicit drug market in the U.S., which is estimated to make a whopping profit of more than $300 billion each year. According to the DEA, Mexico’s Sinaloa cartel exports and distributes wholesale quantities of heroin, marijuana, cocaine and meth all across America through its key distribution centers in Los Angeles, Denver, Chicago and Phoenix. The drugs coming from Mexico are the purest and available at the best possible prices in the Los Angeles area, with the prices soaring new heights, depending on how far they will be shipped and the gravity of risk involved. The government is trying to combat the addiction problem and is spreading awareness about the misuse of drugs. But these efforts will fructify only when people also pledge to end the menace at their level. Notably, addiction to a harmful drug can be treated with timely medical intervention. If you or your loved one is addicted to cocaine, heroin or any other drugs, seek treatment immediately. The Los Angeles Drug Treatment and Rehab Center can help you seek treatment from one of the best rehab centers near you. You may call our 24/7 helpline number at 213-986-2445 or chat online to get information on customized addiction treatment programs suited to your needs.